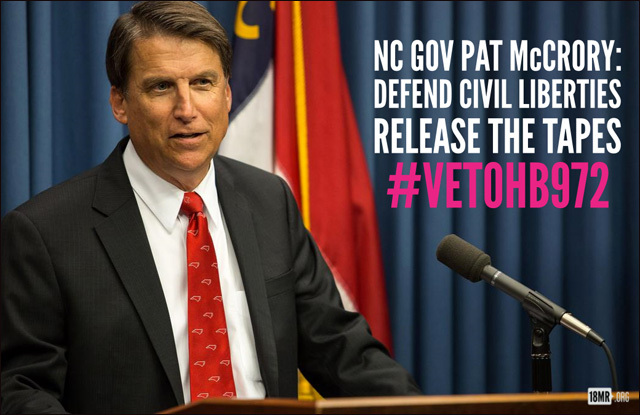 Call Governor McCrory to #VetoHB972! Police recordings -- taken on vehicle dashboard cameras and body-worn cameras -- are a matter of public record vital to preserving civil liberties. Under most states' laws, it's up to city government to decide whether or not to release them in cases of public interest, like when an officer uses deadly force against a civilian. In North Carolina this week, the state legislature passed House Bill 972: a bill that gives police departments direct control, and greater discretion, over how and under which circumstances this crucial video footage is released to the public. We have 10 days to convince Gov. Pat McCrory to veto the bill -- or it becomes the law. Laws like HB972 will make it harder for families to find justice for their loved ones. It already took the family of Chieu Di Thi Vo, a Vietnamese woman with bipolar disorder, two years to see video footage of her last moments of life after she was shot and killed by Greensboro Police Department (GPD) officer T.J. Bloch. Her family repeatedly requested to see Officer Bloch's body camera footage. The Greensboro Police Department denied their requests while publicly claiming that "Chieu Di lunged at officer Bloch [with a knife], yelled that she would "gut" the police officer in Vietnamese, and that Chieu Di's mother's life was in danger." Last month, the footage was finally released revealing that the police had lied. As Chieu Di's family writes: "After viewing the video with our own eyes, we strongly believe that what we saw and heard simply do not match with the GPD's initial assessment of what happened... Officer Bloch stood approximately 10-15 feet away from Chieu Di and only waited for a couple of seconds before he started opening fire on her. Within that distance, he did not have to respond to Chieu Di with lethal force as she was not an imminent threat to his life." If HB 972 passes, people will have to make requests of police departments to view any recordings. Police departments will have sole discretion to deny requests and will even be able to pick and choose parts relevant to the request to be viewed or released. Call North Carolina Gov. Pat McCrory now to ask him to veto this dangerous bill. Body cameras are one part of larger changes needed to address the crisis of police violence, as outlined in Campaign Zero's comprehensive policy recommendations. Without being able to view body camera and dash camera footage, we would not have known what happened to Chieu Di Thi Vo, Tamir Rice, Sandra Bland, Freddie Gray, Walter Scott and countless others. Keeping body and dash camera footage available for public review is a crucial part of creating accountability for law enforcement and building trust in communities of color. Join us by calling Governor McCrory to #VetoHB972!